Looking for a reason to upgrade your bathroom? Yes, it increases your enjoyment of your home and can make mornings and bedtimes run more smoothly, but it can also add value to your home. Bathroom upgrades have now outstripped kitchen remodels in popularity, and can increase your asking price when you’re ready to sell, too! If you’re among those who get excited about renovating your bathroom but feel less enthusiastic about pouring money and energy into a kitchen upgrade, you’re not alone. 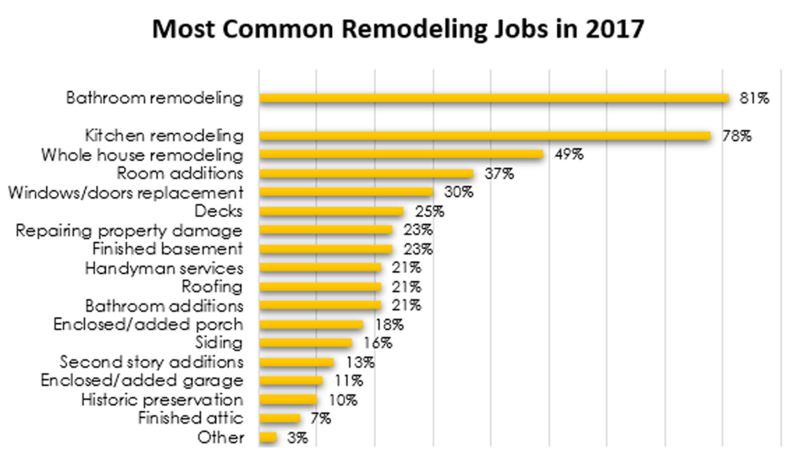 Homeowners find a big payoff both financially and emotionally when they remodel a bathroom, according to the 2017 Remodeling Impact Report by the National Association of REALTORS®. More than half (52%) said the most important result of a bathroom renovation was better functionality and livability, and 71 percent said they have an increased sense of enjoyment when they’re at home. And when it’s time to sell a home, homeowners recoup about half of the project costs for new bathrooms and bathroom renovations.